Traci's catch of the day! While it’s true I was born in California, the Eugene/Springfield area is my home. I’ve lived here since I was a kid. My professional life has included a variety of management and human resources positions. Over time I developed a passion for HR, which to me is human relations rather than human resources. Now I’m happy to bring my passion, expertise and enthusiasm to Essex, where I am the HR & Payroll Manager. When I’m not working, you can usually find me with my husband and son at one sports event or another. We are ‘certified’ sports fanatics and duck fans. When we are not at a game, we enjoy spending time outdoors, traveling and wineries. We love to camp, and enjoy floating down the McKenzie River each summer. 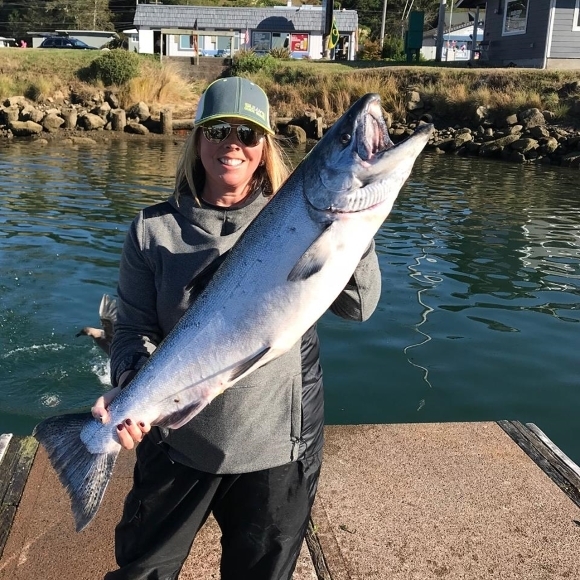 I’ve also taken up salmon fishing, and enjoy going with my girl’s group.